You would like to work in Mexico as a foreigner. Many people think it is really hard to get permission to work here in Mexico as a foreigner but it has become much easier over the years. There have been some real changes over the past years and now you must begin the process of obtaining your residency cards, Temporary or Permanent at the Mexican consulate in your own country. Once this process has been initiated at the consulate you will be directed to return to Mexico to your local office of Instituto Nacional de Migración (INM) to finish the process and receive your Temporary or Permanent Resident card. One of the biggest changes from the past is that once you have a Permanent Card you have blanket permission to work in Mexico but you must advise immigration of any changes as to where or who you work for within 90 days of the change. If you already have a Temporary Resident card you may apply for a change to lucrative status or you may ask for this during your application for your resident card. You may apply either online with Instituto Nacional de Migracion (see the links below) or at your local INM office. Even if you are currently in Mexico you may stay, but once you have your appointment to begin the process for your Temporary or Permanent resident card at your consulate office, you must return to your country for the interview at your Mexican Consulate. This change has frustrated many people who came to Mexico to look for work with a Tourist card (FMMT) and then once they found it they have to return to their country to begin the actual process of obtaining the permit to work. Once you have had your interview and completed all the documentation required, the consulate will send you back to Mexico with a “Folio” (file) number to obtain your resident card and your work permit from your local INM office. If you currently hold a Temporary Resident card you may apply online or at your local INM office to change your status to lucrativo (lucrative). There are several types of employment and depending on whether you are to work for a Mexican, a Mexican business, Mexican corporation, a foreign company or for yourself as a sole proprietor, there will be different requirements that I'll try and explain below. Temporary work of fewer than 30 days is possible on a Tourist Visa for expos, presentations, sales training where you are not bringing inventory for sale but samples and marketing materials you may receive permission on your Tourist Visa for that type of business. For more permanent work of over 30 days whether for income or not, you may need a work permit. According to the government site, if you plan on doing work that a Mexican might be paid for whether you are receiving money or not you will need a work permit. You must obtain permission to work for a corporation (persona moral) or sole proprietor (persona fisca) that is already a legal business entity in Mexico. The employer must provide a letter offering you the job with a full description of the work and what the salary will be. If you change jobs, where or who you work for and or address of your job you must notify INM within 90 days of the change. In order to work for your self, you may either create a Mexican Corporation (Persona Moral) or in some cases, you may use a Limited Liability Corporation (LLC) from the US or become a sole proprietor (Persona Física). If your business is not going to be that large and has few employees there can be tax advantages for being a sole proprietor. It is best to speak with an accountant in Mexico as to what is the best way for you to open a business here. 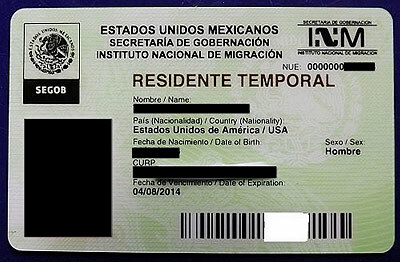 One of the documents you will you need eventually is the Clave Única de Registro de Población (translated into English as Unique Population Registry Code) know as CURP. Everyone who lives in Mexico whether a National or a Foreigner is to have one. To obtain a CURP you must go to the office of Registro Civil and you will need a Letter of Naturalization or your immigration document. See below for the link with a list of the offices fo Registro Civil in Mexico. Once you have the CURP it is much easier to obtain the next document, your personal tax identification number or RFC. In order legally work in Mexico you must have a Registro Federal de Contribuyente (R.F.C ) tax identification number from SHCP (Secretaria de Hacienda y Credito Publico). You may apply online if you have your CURP or you make an appointment online and got to you local Hacienda office. One last thing to discuss is the “Point System” for those of you who wish to have Permanent Resident cards without waiting and holding a Temporary resident card for several years. There is a point system that the consulate may use to allow you to obtain a Permanent Resident Card in order to work right away. There is no exact explanation of how the point system works on the Internet and local immigration officers do not have the details either. He points will be determined by the consulate office where you apply. The government site does explain that if you have a family member that already holds a permanent card you could receive enough points to obtain a Permanent Resident card right away. Another way to receive points if you have work experience or specific skills in science or technology. Also if you're an internationally recognized like a famous actor, artist, or celebrity you may be granted enough points. It is up to the consulate office where you are applying to determine the points and see if you qualify immediately for a Permanent Resident card. Finally, while the process of obtaining a work permit may seem a little daunting to some it really isn't that hard. If you want help there are exterior offices that can help you with the process for a fee. Also remember much of the work you do the first time you will never have to do again. If you plan on living and working here for many years it is well worth the time and hassle.